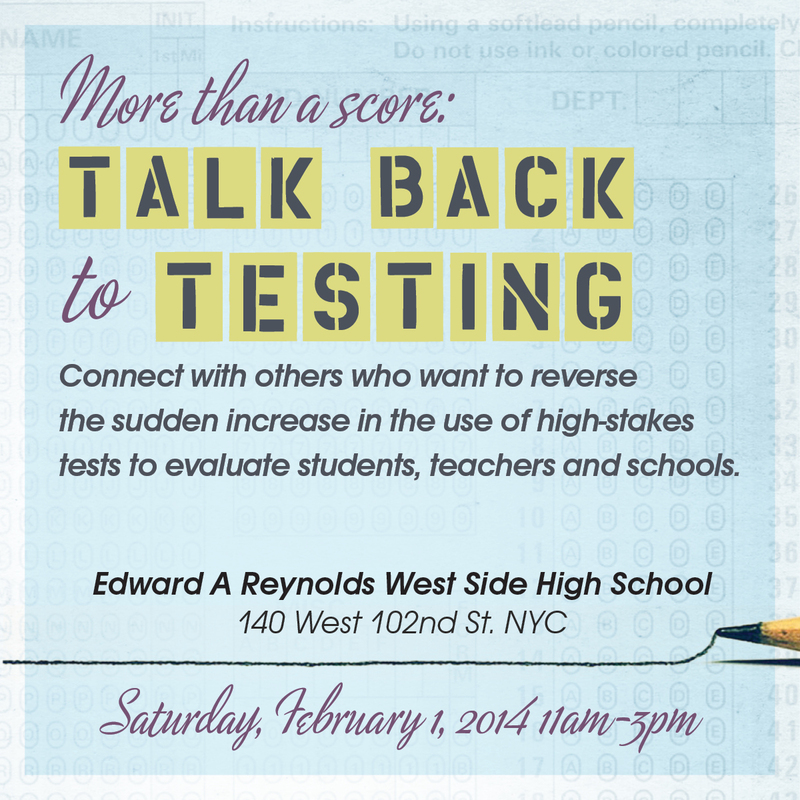 A coming together of NYC parents, teachers, and students, united to discuss solutions to the current testing regime. RSVP TODAY! A variety of presenters representing all the stakeholders in the NYC public school system. We have worked more than four years under an expired contract. We deserve more! 1. Full retroactive pay: We have lived through four years of a wage freeze. Yet our bills, living costs, and transportation have not been frozen. If we agree to a contract now that doesn’t give us full retroactivity we are inviting the city to simply stall all future negotiations in order to impose a de facto wage freeze on us again and again. 2. Clear, enforceable language for reduction of paperwork: The new evaluation scheme, with its artifact collection and the scrutiny of lesson plans, has brought with it enormous paperwork burdens. 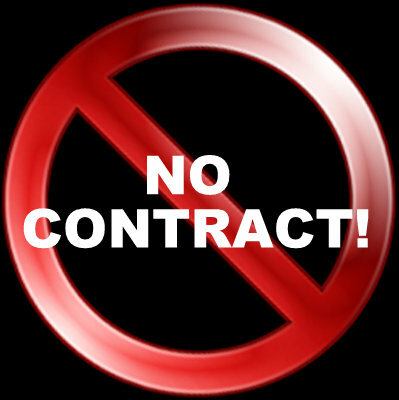 The current contractual language for paperwork reduction (Article 8I) is toothless, while our right to control lesson plan format (8J) has become difficult to enforce. The Measures of Student Learning that inappropriately rate teachers on work outside of their own subject area and classes. The use of the Danielson Framework, a one-size-fits-all rigid teaching prescription that takes away all teacher autonomy. 4. Pattern Bargaining: In 2008 most municipal union workers received 4% raises; UFT members have yet to receive anything. Pattern bargaining has been the traditional method for deciding raises for many years, we can not allow the city to deviate from this, because it will set a precedent that will allow them to negotiate no raises for UFT in coming years. This process has kept our unions strong and working together for many years, not receiving the same raise as the other city workers would threaten the very being of the labor movement in NYC. 5. Increased Wages: The city will argue they cannot afford to pay us the retroactive wages we deserve and increase our salary. The data says otherwise: Since 2005, the city has had annual budget surpluses ranging from $2 billion to well over $4 billion. Mayor Bloomberg’s 2014 Executive Budget states that Wall Street profits rose to $23.9 billion in 2012, (third highest on record) and will be $13.4 billion in 2013, tax revenue continues to increase. Let’s not forget the city continues to waste money; The Office of the New York State Comptroller issued an audit examining the DOE’s $342 million in non-competitive contracts. In 2013 the cost of the networks that’s schools belong to was at least $76.6 million. Millions of dollars are wastefully spent on educational consultants, test prep companies, Common Core/Danielson implementation, and on other failed projects such as ARIS and CityTime. We live in the most expensive city in the world and it’s time to give UFT members the raises we deserve! To discuss a question by considering opposed arguments. UFT Delegate Assemblies are awash in a sea of undemocratic procedures. One of the most egregious has been the abuse of the rules that govern debate. The leadership and its UNITY Caucus supporters have 100 minutes to present their case plus a 10-minute question period, with the President’s report taking up a good chunk of the time. Alternate voices have a 10 minute “new motion” period. But even those 10 minutes are encroached upon when the leadership uses the pretense of presenting its own “new” motions despite the fact they have the power to add them to the regular agenda. But they go even further by restricting or shutting down debate. President Mulgrew is violating Robert’s Rules of Order overtly when he calls exclusively on supporters of motions. His argument that he doesn’t know where people stand when he calls on them holds little water given that most of the speakers are members of his own Unity Caucus and are often, in fact, UFT officials on the UFT payroll. His job as president is to alternate between those who are in favor and those who are against a motion. Therefore, after a Unity person motivates a motion, Mulgrew’s obligation is to call on someone opposed as long as someone rises and demands the floor at the same time as a friend of a motion. The Rules call, for not just one speaker on the other side, but half of them in every debate. Delegates have seen this basic principle of democratic debate routinely ignored, often with only a one-sided point of view being aired. There can be no “union” without a democratic union. In the interests of having a democratic union that follows the rule of law and welcomes vigorous, open debate, we urge all union members to support a movement for a more democratic union. Let us begin this movement at the Delegate Assembly. Randi Weingarten recently wrote in an article titled “Time to End Failed Policies of NCLB & RTTT.” Will the UFT refuse to sign on to any renewals of RTTT in NYC? 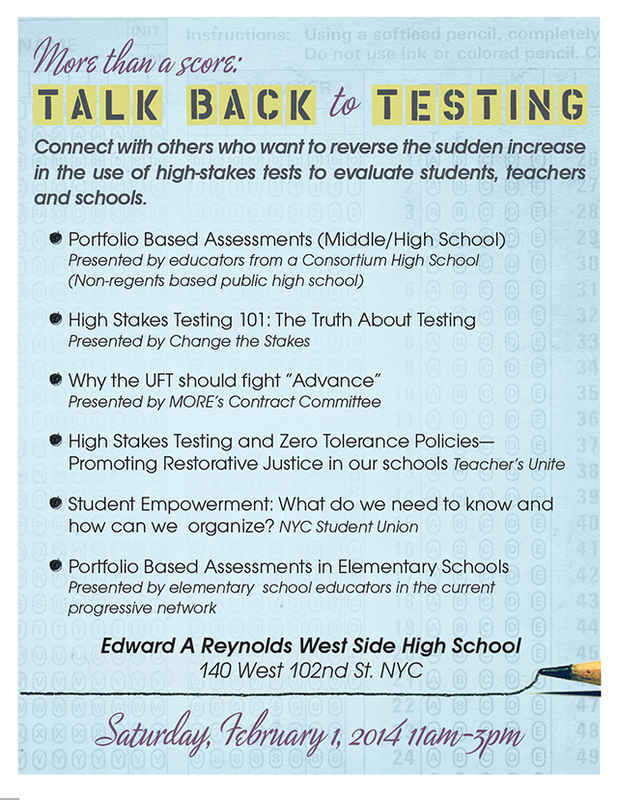 Now that we passed a resolution to end high stakes associated with Common Core tests, what is our political follow up? Are there plans for childcare at DA meetings? MORE is proud to endorse the call by our friends and allies in ICOPE, BYNEE and MANY for a chancellor who has a progressive vision for New York City schools and for a open and democratic process for their selection that includes the voices of parents, teachers and students. Note: I am an active UFT and MORE member because I believe that our union can be a powerful voice for the teaching profession, the quality of our education system, and ultimately the quality of our society. Though I am critical of our current UFT leadership, my criticism is meant to be constructive and is directed towards the goal of building a stronger, smarter, more democratic UFT. If you’d like to get involved with the work of building a stronger union, click here to join MORE online, or come meet us at our Holiday Party this Friday (Dec 6th). If you read my last post, you know that I came to the November 20th UFT delegate assembly ready to speak in favor of our Resolution for an End to the New Evaluation System. Despite preparation and support from my colleagues and fellow MORE members, I was nervous. Why was I nervous? In UFT delegate assemblies, Robert’s Rules of Order (with the addition of extra Rules of Order printed on each agenda) enable completion of the planned agenda before 6pm. They also severely limit discussion. There are 15 minutes allotted for questions from delegates, and only 10 minutes for motions directed to the agenda from delegates. (The President’s report, however, does not have a time limit, and often occupies the majority of the meeting time.) I have also observed many occasions on which delegates who rise to speak are belittled or treated disrespectfully. I knew that I would need to speak as well and as concisely as I could. So I planned, drafted, and re-drafted what I might say. To read my plan, click here. Armed with this plan and copies of the resolution, I arrived at the delegate assembly early to pass out the resolution so that delegates could read over it before it was time to vote. UNITY, the caucus to which all the UFT leadership belongs, distributed its own flyer at the beginning of the meeting. 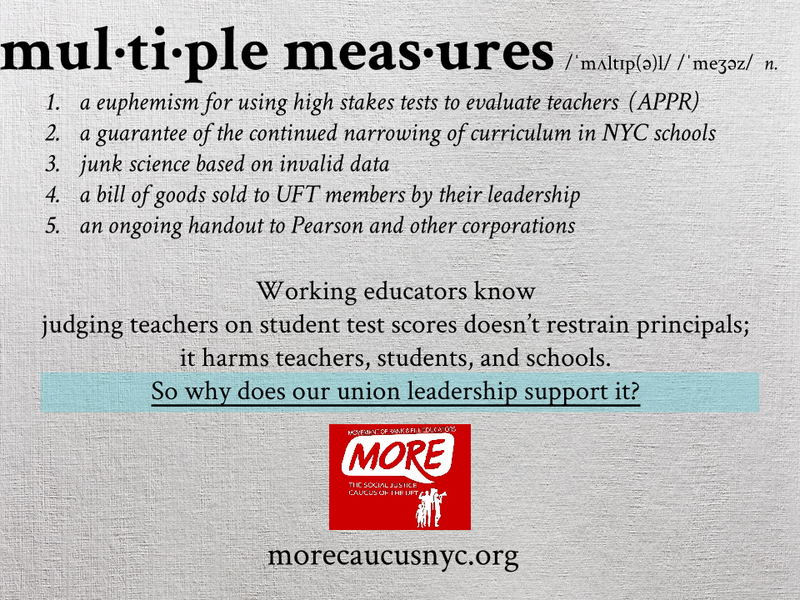 Among other things, the flyer criticized MORE, in an inaccurate and deceptive way, saying that MORE “believes that principals should have complete and unchecked authority when it comes to a teacher’s evaluation.” I was shocked and insulted that the UNITY leadership thought their own delegates would accept such a spurious claim. No group of teachers would ever advocate for such a simple way of assessing our complex and valuable work, and any group of elected delegates should easily recognize such a statement as a distortion of MORE’s view. Additionally, the flyer and the President’s report asserted that the UFT leadership was fighting “Advance. ” I wonder, where is this fight? Most teachers I know do not feel involved in, or even aware of any kind of larger resistance to “Advance.” Instead, they are stressed out about extra standardized tests, frustrated with pushing paperwork until late at night, and striving to infuse as much genuine joy as possible into common-core aligned lessons. 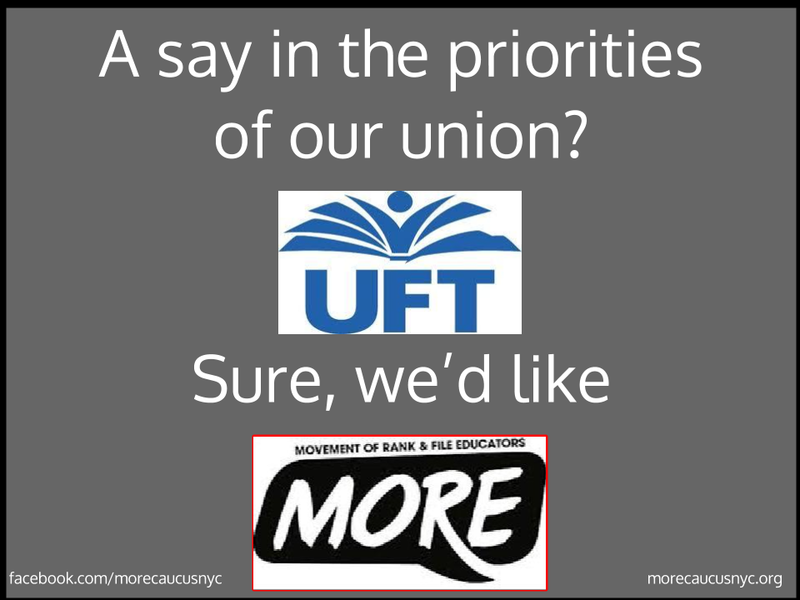 If UFT members are tired, we are tired of being forced to implement poorly planned dictates that mean more paper work, more time testing, and less time focused on our students. We are tired of being told to do stupid things, but we are ready to fight them. We need our union to lead us in the fight for a system in which we can focus on what we love—teaching our students. President Mulgrew and I agree that Advance gets in the way of our teaching. He called advance a “paperwork disaster” created by “the people who hate us” (referring to the corporate interests that usually bash teachers). When I stood to raise our resolution, I adjusted my planned words to echo these ideas, and to include many of the thoughts above. Recording is not allowed in the delegate assembly, so I’m not sure exactly what words I used, but my main idea remained the same. “Advance” reinforces the corporate notion that our teaching, and our children, are standardizable products to be quantifiably measured. We must fight for the collaborative creation of a teacher evaluation system that empowers teachers, not testing companies, not administrators, and not bureaucrats. We deserve that smart system, and so do our students. After I spoke, Janella Hines, one of the UFT Vice-Presidents, spoke against our resolution. Debate was over, as per the rules of the Delegate Assembly*, and there was a vote as to whether or not a debate and vote on our resolution would be added to the agenda for next month. Since votes are not counted in UFT meetings (problematic! ), we don’t know exactly what the totals were (I’ve heard estimates at 30-70 and 40-60), but a “visual majority” did not support adding our resolution to the next agenda. Perhaps the majority of the UFT delegate assembly isn’t ready to fight Advance, but are you? If so, join MORE’s campaign to reject “Advance!” Help us push the UFT leadership to be more democratic and inclusive of rank-and-file teacher input, and lend your expertise towards fighting what Diane Ravitch calls the “corporate education deform movement.” Continue this conversation with your colleagues, sign our petition, come to a meeting, contact us, or come celebrate with us at our holiday party this Friday! Though a “for” and “against” position on our resolution (as per UFT rules) was presented during the meeting, I don’t believe this constitutes a full and fair “working through, ” and I think that this rushed treatment is all too often the case with important topics in the delegate assembly. Furthermore, the website states that, “Under no circumstances should “undue strictness” be allowed to intimidate members or limit full participation.” I know I’m not the only delegate who feels intimidated by speaking. As for full participation, it is already decidedly limited when only 15 percent of our membership voted in the 2012 UFT elections, and the Union Hall doesn’t even have enough space to hold close to the 3, 406 elected delegates.